BRP 's 2010 line-up of Can-Am ATVs feature the industry's first air-controlled suspension system and a new dynamic power steering with dual-mode, speed-sensitive power assist, and next-generation Visco-Lok QE automatic front differential. While the Can-Am ATV brand continues to strengthen its position as the brand for ATV enthusiasts, BRP's 2010 models bring even more value through innovation to the ATV industry. 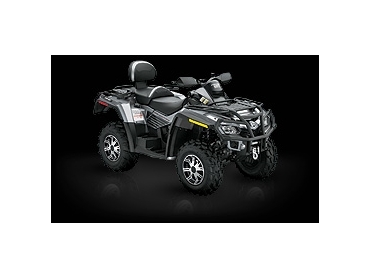 Features like bringing user control to power steering through its dual-mode, speed-sensitive dynamic power steering system and a six-way adjustable air-controlled suspension system give ATV enthusiasts more control over the riding experience. Can-Am ATVs always feature competitive power, handling and design features, and now, BRP brings new technologies that inject value into ATV riding. "The 2010 line-up of Can-Am ATV's provide both value and innovation to our consumers. The new range reinforces our position as the brand that continues to innovate while delivering on its promise as the choice for the ATV enthusiast,” said Asia Pacific General Manager, Gregoire Dupont. Air-controlled suspension – The Outlander 800R MAX EFI LTD comes with the industry's first adjustable air-ride suspension. The compressor which activates the six-position, rider-selectable ACS system can also be used to fill tyres while on the trail. Dynamic power steering – Can-Am debuts its highly advanced, speed sensitive, dual-mode power steering system on selected Outlander and Renegade models. Dynamic power steering equipped models come with the revised, quicker-engaging Visco-Lok QE front differential. Outlander Cast-Aluminum Wheels – Nearly all Can-Am Outlander ATVs come with premium cast-aluminum wheels. More Outlander 650 Power – A revised calibration on the Rotax 650 powerplant help generate seven-percent more power than last year’s engine to further enhance its position as the most powerful production ATV below 800cc. Further to these features, the Renegade 800R X xc package for the serious trail rider comes with a range of features never seen before on a 4x4 ATV, including full beadlock wheels, premium suspension, dual-mode dynamic power steering and a front sway bar, making it the ultimate cross-country package. With the addition of new technologies, more power and value for money, BRP is ready to meet the needs of any ATV enthusiast in 2010. From the Outlander 800R MAX LTD to the Renegade 800R to the DS 450X mx and DS 90, there is a Can-Am ATV model for any application - whether on the track and trail or on the farm.